One of the cornerstones of implementation science is the use of theory. Unfortunately, the vast number of tools available in the implementation science toolkit can make it difficult to determine which is the most appropriate to address or frame a research question. There are dozens of theories, models, and frameworks used in implementation science that have been developed across a wide range of disciplines, and more are published each year. Tabak et al’s schema organizes 61 dissemination and implementation (D&I) models based on three variables: 1) construct flexibility, 2) focus on dissemination and/or implementation activities, and 3) socio-ecological framework level. Adapted from: Nilsen P. Making sense of implementation theories, models and frameworks. Implement Sci. 2015;10(1):1-13. 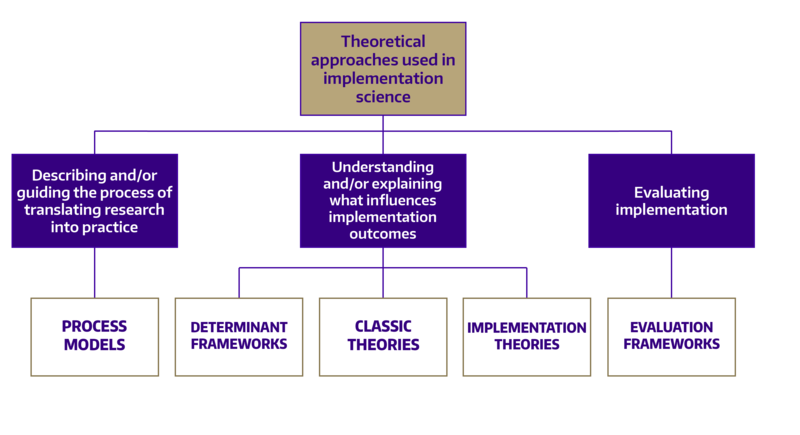 Below, we borrow from Nilsen’s schema to organize overviews of a selection of implementation science theories, models, and frameworks. In each overview, you will find links to additional resources. Please note some journals will require subscriptions to access a linked article. What are you using implementation science to accomplish? In 2012 Meyers, Durlak, and Wandersman synthesized information from 25 implementation frameworks with a focus on identifying specific actions that improve the quality of implementation efforts. The result of this synthesis was the Quality Implementation Framework (QIF), published in the American Journal of Community Psychology. This framework is comprised of fourteen critical steps across four phases of implementation, and has been used widely in child and family services, behavioral health, and hospital settings. In 2008, Feldstein and Glasgow developed the Practical, Robust Implementation and Sustainability Model (PRISM) to address the lack of consideration of non-research settings in efficacy and effectiveness trials. This model evaluates how the intervention interacts with recipients to influence program adoption, implementation, maintenance, reach, and effectiveness. The framework development article was published by The Joint Commission Journal on Quality and Patient Safety. Recognizing that implementation science frameworks were largely developed using research from business and medical contexts, Aarons, Hurlburt, and Horwitz created the four-phase implementation model EPIS (Exploration, Adoption/Preparation, Implementation, Sustainment) in 2010 to address implementation in public service sector contexts. The framework development article, Advancing a Conceptual Model of Evidence-Based Practice Implementation in Public Service Sectors, is available open access from Administration and Policy in Mental Health and Mental Health Services Research. In 2018 the authors refined the EPIS model into the cyclical EPIS Wheel, allowing for closer alignment with rapid-cycle testing. "A model for rigorously applying the Exploration, Preparation, Implementation, Sustainment (EPIS) framework in the design and measurement of a large scale collaborative multi-site study" is available Open Access from Health & Justice. In 2013, Chambers, Glasgow, and Stange published The dynamic sustainability framework: addressing the paradox of sustainment amid ongoing change in the open access journal Implementation Science. The Dynamic Sustainability Framework arose from the need to better understand how the sustainability of health interventions can be improved. The need to adapt to local context is a consistent theme in the adoption of evidence based practices, and in 2012 researchers published the Dynamic Adaption Process to address this need. Finding that adaptation was often ad hoc rather than intentional and planned, the DAP helps identify core components and adaptable characteristics of an evidence based practice and supports implementation with training. The framework development article, Dynamic adaptation process to implement an evidence-based child maltreatment intervention, was published in the open access journal, Implementation Science. In 2009, Veterans Affairs researchers developed a menu of constructs found to be associated with effective implementation across 13 scientific disciplines. Their goal was to review the wide range of terminology and varying definitions used in implementation research, then construct an organizing framework that considered them all. The resulting Consolidated Framework for Implementation Research (CFIR) has been widely cited and has been found useful across a range of disciplines in diverse settings. For additional resources, please visit the CFIR Technical Assistance Website. The website has tools and templates for studying implementation of innovations using the CFIR framework, and these tools can help you learn more about issues pertaining to inner and outer contexts. You can read the original framework development article in the open access journal Implementation Science. In 2005, Dr. Susan Michie and colleagues published the Theoretical Domains Framework in BMJ Quality & Safety, the result of a consensus process to develop a theoretical framework for implementation research. The primary goals of the development team were to determine key theoretical constructs for studying evidence based practice implementation and for developing strategies for effective implementation, and for these constructs to be accessible and meaningful across disciplines. In 2005, the National Implementation Research Network (NIRN) published a monograph synthesizing transdisciplinary research on implementation evaluation. The resulting Active Implementation Frameworks (AIFs) include the following five elements: Usable Intervention Criteria, Stages of implementation, Implementation Drivers, Improvement Cycles, and Implementation Teams. A robust support and training website is maintained by NIRN, complete with activities and assessments to guide active implementation. Using collective experience in research, practice development, and quality improvement efforts, Kitson, Harvey and McCormack proposed in 1998 that success in implementation is a result of the interactions between evidence, context, and facilitation. Their resulting Promoting Action on Research Implementation in Health Services (PARIHS) framework posits that successful implementation requires clear understanding of the evidence in use, the context involved, and the type of facilitation utilized to achieve change. The original framework development article, Enabling the implementation of evidence based practice: a conceptual framework is available open access from BMJ Quality & Safety. Diffusion of Innovation theory has its roots in the early twentieth century, but the modern theory is credited to Everett Rogers with his publication in 1962 of Diffusion of Innovations. This theory holds that adopters of an innovation can be split into five categories that distribute in a Bell curve over time: innovators (2.5%), early adopters (13.5%), early majority (34%), late majority (34%) and laggards (16%). Further, the theory states that any given adopter's desire and ability to adopt an innovation is individual, based on information about, exposure to, and experience of the innovation and adoption process. In 2017 Birken and colleagues applied four organizational theories to published accounts of implementing a particular evidence-based program, in order to determine whether these theories could help explain implementation success by shedding light on the impact of the external environment on the implementing organizations. Their paper, Organizational theory for dissemination and implementation research, published in the journal Implementation Science utilized transaction cost economics theory, institutional theory, contingency theories, and resource dependency theory for this work. 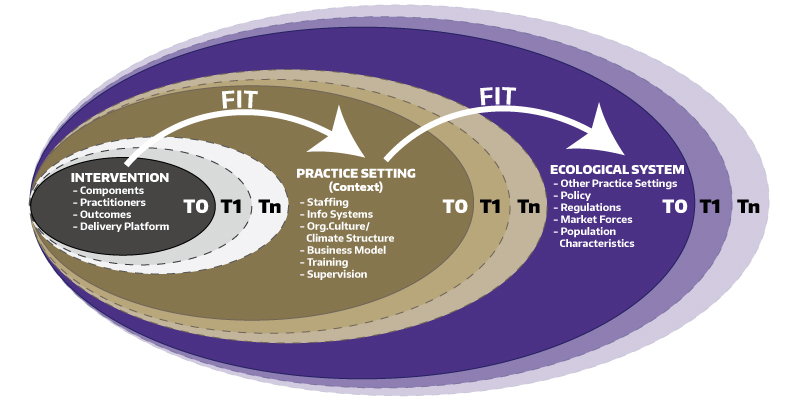 In 2005 the National Institutes of Health published the second edition of Theory at a Glance: A Guide For Health Promotion Practice, which provides an overview of theories across the ecology of behavior change in health behavior. This primer is a useful way to learn about various theories in a manner that, to quote the Forward, is 'neither overwhelming nor superficial.' Below we have selected a few theories from the intrapersonal and interpersonal ecological levels that are most relevant to implementation science. The Health Belief Model: One of the initial theories of health behavior, the HBM was developed in the 1950s by a group of social psychologists in the U.S. Public Health Service wishing to understand why health improvement services were not being used. The HBM, which eventually arose from this work, posited that in the health behavior context readiness to act arises from six factors: perceived susceptibility, perceived severity. perceived benefits, perceived barriers, a cue to action, and self-efficacy. For a thorough explanation of the history of the Health Belief Model, please refer to Rosenstock's 1974 publication "Historical Origins of the Health Belief Model" (Health Education Monographs). The Theory of Planned Behavior: This theory, developed by Ajzen in the late 1980s and formalized in 1991, sees the primary driver of behavior as being behavioral intention. Through the lens of the TPB, behavioral intention is believed to be influenced by an individual's attitude, their perception of peers' subjective norms, and the individual's perceived behavioral control. At the interpersonal behavior level, where individual behavior is influenced by a social environment, Social Cognitive Theory is the most widely used theory in health behavior research. Social Cognitive Theory: Published by Bandera in the 1978 article, Self-efficacy: Toward a unifying theory of behavioral change, SCT consists of six main constructs: reciprocal determinism, behavioral capability, expectations, observational learning, reinforcements, and self-efficacy (which is seen as the most important personal factor in changing behavior). In 2009, Bryan Weiner developed a theory of organizational readiness for change to address the lack of theoretical development or empirical study of the commonly used construct. In the development article, organizational readiness for change is conceptually defined and a theory of its determinants and outcomes is developed. The focus on the organizational level of analysis filled a theoretical gap necessary to address in order to refine approaches to improving healthcare delivery entailing collective behavior change and in 2014, Shea et al published a measure of organizational readiness for implementing change, based on Weiner's 2009 theory, available open access through Implementation Science. In 2011, Weiner, Belden, Bergmire, and Johnston published The meaning and measurement of implementation climate in Implementation Science to address the lack of theory behind the impact of climate in innovation implementation. They argued that implementation climate is distinct from constructs such as organizational climate, culture, or context in both its strategic focus on implementation and because it is innovation-specific. In 2010, Elizabeth Murray and colleagues published Normalisation process theory: a framework for developing, evaluating and implementing complex interventions, comprised of four major components: Coherence, Cognitive Participation, Collective Action, and Reflexive Monitoring. The authors argued that using normalisation process theory could enable researchers to think through issues of implementation concurrently while designing a complex intervention and its evaluation. They additionally held that normalisation process theory could improve trial design by highlighting possible recruitment or data collection issues. In 1999, authors Glasgow, Vogt, and Boles developed this framework because they felt tightly controlled efficacy studies weren’t very helpful in informing program scale-up or in understanding actual public health impact of an intervention. The RE-AIM framework has been refined over time to guide the design and evaluation of complex interventions in order to maximize real-life public health impact. This framework can thus help researchers collect information needed to translate research to effective practice, and may also be used to guide implementation and potential scale-up activities. You can read the original framework development article in The American Journal of Public Health. Additional resources, support, and publications on the RE-AIM framework can be found at RE-AIM.org. 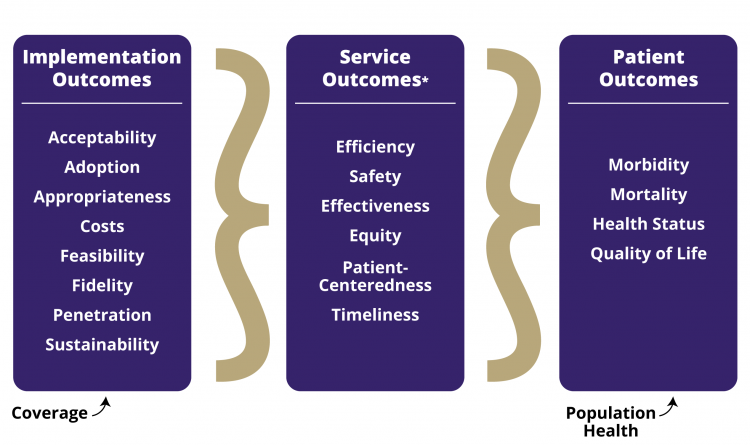 In their 2011 publication, Proctor and colleagues proposed that implementation outcomes should be distinct from service outcomes or clinical outcomes. They identified eight discrete implementation outcomes (acceptability, adoption, appropriateness, feasibility, fidelity, implementation cost, penetration, and sustainability) and proposed a taxonomy to define them. The framework development article, Outcomes for Implementation Research: Conceptual Distinctions, Measurement Challenges, and Research Agenda, is available through Administration and Policy in Mental Health and Mental Health Services Research.